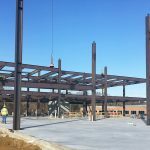 The five-story building, comprising about 130,000 square feet of Class A Office space within Annapolis Corporate Park at 187 Harry S Truman Parkway in Annapolis, is under construction. St. John Properties has launched a speculative building spree across several property types in central Maryland. 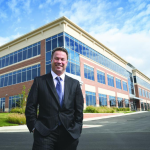 The company has started construction on eight buildings totaling 500,000 square feet of space. At developments in Anne Arundel County and Baltimore County the company has started building office, retail, flex/research and development space, investing $51 million in the projects. St. John Properties’ rosy outlook on the economy, at least in the short term, is shared by other developers and commercial real estate services firms. In its fourth-quarter market report for the Baltimore metro area, commercial real estate services firm Newmark Knight Frank found the Baltimore region’s unemployment level dipped to 3.9 percent down from 4.3 percent at the same time the year before. Education/health and mining, logging and construction were the leading sectors for job growth. In a fourth-quarter report for MacKenzie Commercial Real Estate Services, economist Anirban Basu wrote that the nation’s economic growth, the longest such expansion on record, is expected to pick up steam. The reasons behind that are up for debate, he argues, but Maryland’s economy has boomed, reaching sixth nationally in percentage of job growth and second among states east of the Mississippi River. “In short, 2018 is shaping up to be another year of job growth, stable office leasing activity, and abundant commercial real estate transactional volume,” Basu writes. 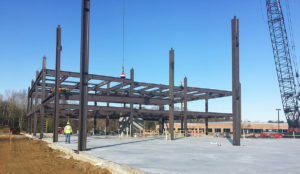 St. John Properties’ construction plans include 300,000 square feet of office space at three sites in Anne Arundel County, consisting primarily of Class A office space and 34,500 square feet of flex/research and development space. 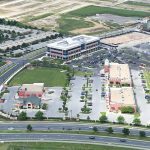 The company is also building 200,000 square feet of space at the Greenleigh at Crossroads development in the White Marsh section of Baltimore County that mostlys consists of Class A office space. The projects will be delivered between spring of this year through the middle of 2019. The investment in suburban office space follows a swing in the Baltimore region that goes against national trends. In most urban areas, office markets in cities are outperforming their city counterparts. But in the Baltimore region it has been the opposite. According to Newmark Knight Frank, suburban office markets absorbed 1.4 million square feet more office space in aggregate than did the city.